It takes a special quality horse to be awarded the title of Therapy Horse. First and foremost is temperament, a pleasant, easy-going, quiet attitude is a must as this cannot be taught at a center, it must come naturally to the horse. If your vehicle had 250,000 miles on it, two broken windows and no brakes, would you donate it to the neighborhood nursing home to use for transporting clients? Many people who have horses that are worn out consider donating them to a therapeutic equine center. After all, don’t therapy horses just have to walk slowly and occasionally trot slowly, around a flat arena, and they get lots of attention, a perfect way to spend their retirement years! A therapy horse can be asked to give up to six hours of lessons per day, five days a week. 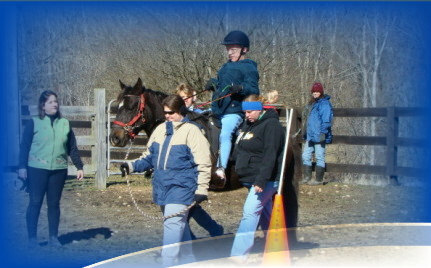 In any given one hour lesson a therapy horse may work at a fast-paced walk or a consistent trot. A few horses are even asked to canter for a portion of their lessons and most must canter for their conditioning program. At Therapeutic Animal Partners we offer other disciplines such as interactive vaulting and therapeutic driving so some of our therapy horses must be appropriate for these types of lessons. Therapy horses must tolerate being crowded by groups of people (a rider, two sidewalkers, a leader and the instructor), unsteady riders who may inadvertently pull on the reins, lots of noise and action all around them, and being groomed several times a day with participants and volunteers touching and leaning all over them. Therapy horses may carry riders who are unable to mount from the ground so they use a mounting ramp. This process entails fitting the horse tightly between two stationary objects (the mounting ramp and mounting block) with an unstable rider and two to three people around to assist. Most important to the riders, therapy horses are asked to play various games such as basketball, moving velcro objects around (makes a strange noise), trail courses and other imaginative ideas. All of these activities can be frightening to a horse that is not properly trained to relate to them. Therapeutic equine centers match each of their participants to a therapy horse that best fits their lesson needs. Each of these horses has their own personalities, movements and strengths. 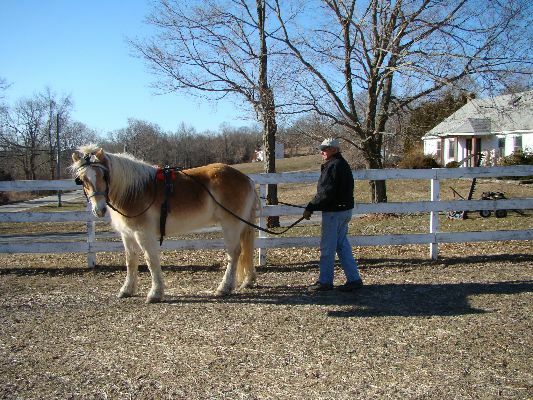 Centers utilize many different breeds of horses in their programs: Arabians, Quarter Horses, Halflingers, Shetlands, Thoroughbreds, Tennessee Walking Horses (and other gaited breeds), Belgians, Percherons, Appaloosas, Miniature Horses, even mules! Centers use the movement of the horse as a teaching tool, so it is imperative that the horses are not limping, short stepping, or lame in any way (all therapy horses must be serviceably sound). To a person who has never walked before, the movement of a horse at the walk can simulate a walking motion in the rider’s hips while they are mounted. The horses gait is very important to consider when pairing with a rider. A rider who needs more stimulation will benefit most from a horse with a choppier stride (like an Arabian). Riders who are tense or prone to seizures benefit most from a smooth gaited horse. Even the horse’s frame has to be taken into consideration. Narrow horses are good for riders who cannot separate their legs very far. A wide-based horse is good for riders who need a larger base for balance. Ø well-trained: we have found that horses with backgrounds in areas such as polo, pony club, 4-H, dressage, western pleasure, hunter and so on are usually very well suited to life as a therapy horse. With our limited time and resources, we do not often have the ability to train a horse from the ground up, we are only able to provide training in specific therapeutic areas such as the mounting ramp, various toys and games, and getting use to sidewalkers walking beside them during a lesson. All horses must have a current negative coggins test within the past six months and be up-to-date on all annual vaccinations. Therapeutic Animal Partners cannot accept horses that have chronic health issues such as hock problems, back pain, loss of vision/hearing, etc. as it is too much of a financial burden for our non-profit center. 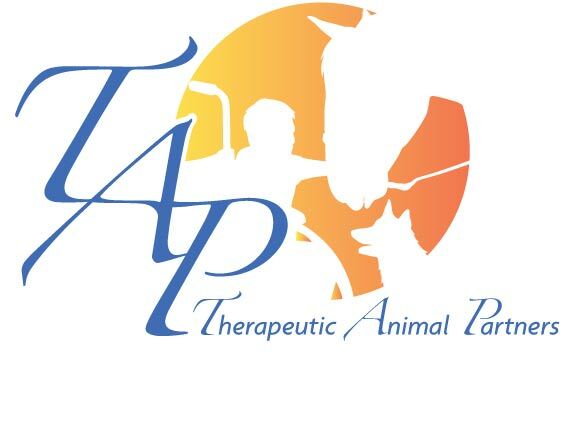 Therapeutic Animal Partners has a well-defined therapeutic training program that we put all potential horses through. If the horse performs successfully then they are accepted into the program and given a loving, working environment to call home. Those that are not suited for our therapeutic programs are returned to their gracious owners. We do request that all donated horses come to the center with their current head stall and bit so they are comfortable during their training period. We are always looking for therapy horse donations at our center. If you have a trustworthy companion you think would qualify as a therapy horse please fill out the Horse Profile and forward it on to our center.